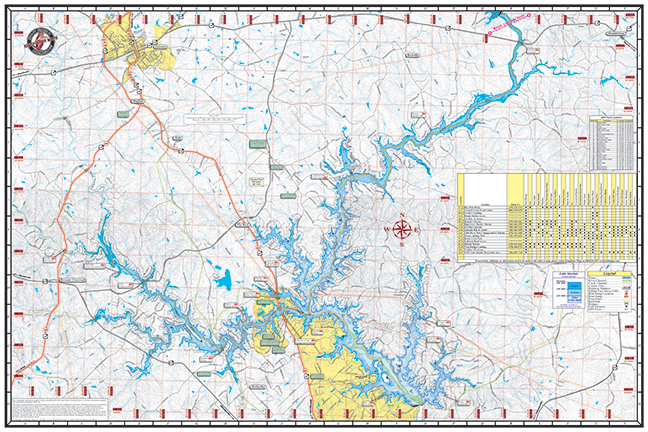 Lake Oconee & Lake Sinclair #317 – Kingfisher Maps, Inc.
2-sided 24″x36″ Waterproof & Tear Resistant Map. GPS Compatible with Marina Listings, Boat Ramps, Lake Structure, Road Network, and More! Lake Oconee was built in 1980 when Georgia Power Company completed the Wallace Dam. It is located along the Oconee River and has provided electricity for many Georgians. The water in Lake Oconee is recycled from Lake Sinclair to produce electricity. Lake Oconee is the second largest lake in Georgia. 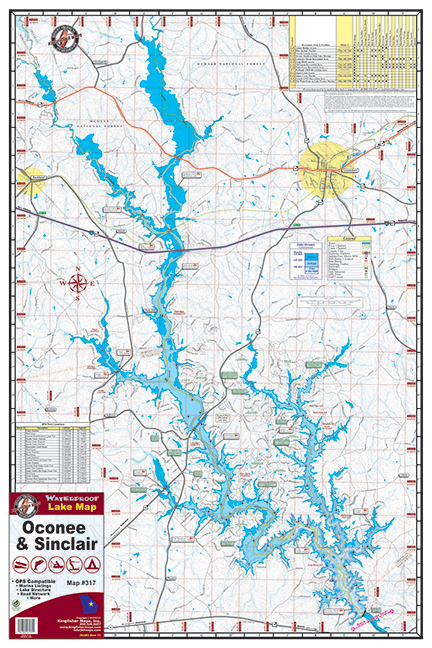 Lake Oconee covers parts of three counties: Putnam, Greene and Morgan. The lake has approximately 375 miles of shoreline. Lake Oconee is fed by the Oconee and Appalachee Rivers. This scenic resort area is tucked away in one of the most beautiful regions of the state. The lake is easily accessible, being located just a short drive from Atlanta, Athens and Augusta. Lake Oconee has become Georgia’s premier golf and lake resort. Waterproof and Tear Resistant! Lake Sinclair has provided both electricity and recreation since 1953. The 15,330-acre body of water has 417 miles of scenic shoreline with charming coves and inlets as well as long stretches of open water.